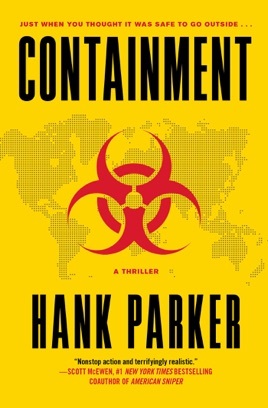 From Hank Parker, a former Homeland Security advisor specializing in bio- and agro-terrorism, comes a chillingly realistic debut thriller about a global plot to release a deadly virus and the elite response team who must try and stop it. It’s a race against time to both find a vaccine and unravel a bio-terrorist conspiracy when a terrifying new tick-borne virus is traced to an extremist group in Southeast Asia. Government epidemiologist Mariah Rossi must leave the safety of her lab behind to help CIA agent Curt Kennedy track the disease to its source. Their harrowing journey from one hot zone to another takes them from the jungles of the Philippines to the coral reefs near Malaysian Borneo, then back to the United States where martial law has been declared to keep the deadly disease contained. For fans of Michael Crichton and Richard Preston, this “is a true thriller with non-stop action and a terrifyingly realistic look at what could happen if terrorists were able to release a virus in America” (Scott McEwen, author of American Sniper). A mad scientist threatening the human race by releasing a horrific bioweapon? Check. A plucky, attractive female scientist pressed into field work to thwart him? Check. At least one damsel in distress scenario for her? Check. A budding attraction between the scientist and a hunky, secretive man with whom she's partnered? Check. Parker leaves few genre clich s unused in his predictable debut, which fails to capitalize on his background as the former acting director of Homeland Security for the Agricultural Research Service of the USDA. A megalomaniac who calls himself Doctor Vector has been breeding ticks to carry the deadly Kandahar virus. When the disease begins to kill off residents of Pennsylvania, veterinary epidemiologist Mariah Rossi and agent Curt Kennedy, of the Bio Investigative Service, join forces to prevent further casualties. The romance that develops between them is, at best, a distraction from the severity of the Kandahar threat. Not naming the secondary characters who fall victim to the virus also creates emotional distance in this disappointing thriller.